Tiger face painting designs are very popular but this new design will make you stand out among all your feline friends. It takes a bit of patience and the ability to stay still during the makeup session, but the result is worth it! Wet the sponge and start spreading the orange color on the face. Do not cover the eyes. Apply yellow in the center of the face. Using the brush, draw white detail around the eyes and mouth. Finish by applying with a brush, black lips and nose. 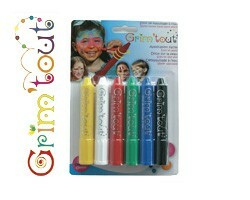 Grim'tout makeup is the perfect accessory for your makeup to easily succeed your design of choice for carnival. Check out the box 6 cosmetic pencils that will be of great help to achieve the makeup design of your child. 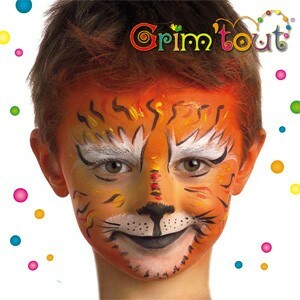 Grim'tout is a professional and cosmetic quality product and offers many makeup ideas for birthday, carnival and all children's parties.